If you want to support our work on development of the Sparky Framework, please subscribe for a premium account from the HotThemes site. For price starting from $39, you can get access of our support tickets and download premium products. Using a modern support tickets system, you will get fast and professional support for the Sparky Framework directly from its developers. You can also get access of our Community Forum where you can meet 1000s of other users of the framework. 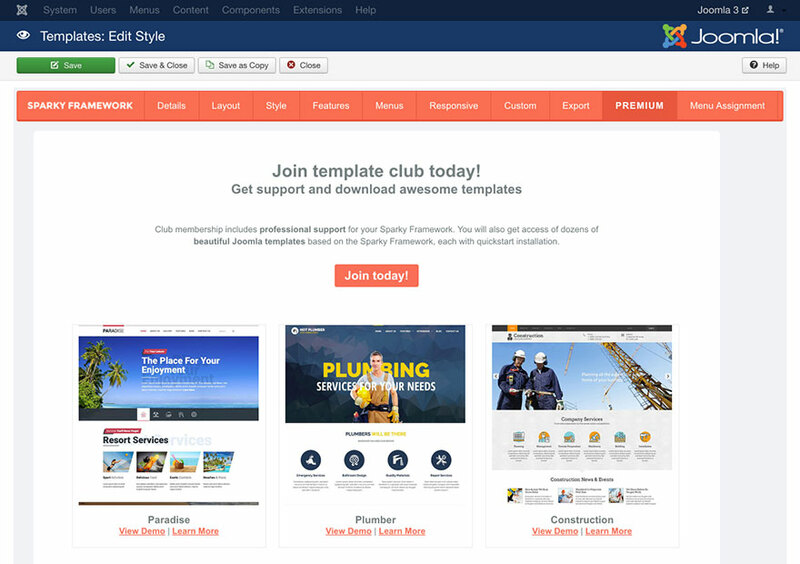 Beside the professional support, as a premium member you will be able to download many professionally designed Joomla templates, based on the Sparky Framework. A large collection of the templates for various purposes will be one click away from you. And, the best of all, they are powered by the Sparky Framework, environment that’s familiar to you. Last but not least, beside the templates, we also have many additional premium Joomla modules and plugins available for our premium members.